When you start RVing, one of the biggest dilemmas you'll run into is where to park your RV. Most RVers will tell you scheduling a spot in an RV park or campground months in advance is the way to go. Others will encourage you to throw caution to the wind and park wherever you find a spot. If you're one of the latter types of RVers, you can use these five places to park an RV in a pinch. Truck stops aren't just for trucks, tractor trailers, and over-sized rigs anymore. RVs are parked overnight at truck stops across the country every day. If you make sure you observe the rules of truckers, you'll be fine. Be courteous, park straight and be gone by mid-morning if you choose to park here. One of the benefits of truck stops is that you can meet some interesting people and learn about the culture that's developed from these stops. Pro Tip: Truck stops bring all sorts of people in and out of the parking lot during all hours of the day. Make sure to lock your doors, windows, and keep valuables out of sight for safety whether you’re in the RV or out exploring. Many casinos, especially those along the NASCAR circuit, allow RVs to park when the spaces are available. Some casinos charge a small fee during peak weekends and holidays. It's important to call ahead and check with management before parking. You want to ensure you park far away from parking spots to make sure you will not get towed. Some casinos have specific spots for RVers, and they fill up. Other casinos allow RVers to park so long as they're far enough away from the entrance. Pro Tip: During NASCAR race weekends, stay away from casinos if you need to park somewhere. These spots are sold ahead of time to NASCAR fans for races coming to town. Walmart encourages RVers to park at their stores when it's safe to do so. Some Walmart parking lots even have RV parking spots painted to show where to park. If you don't see these types of spots, Walmart still encourages RVers to park in their lots. Take the time to talk to the store manager, so you know where to park. Always ensure you park away from customers and entrances. It helps if your shop in the Walmart you’re staying at as well to show your appreciation for parking there. Pro Tip: Walmart has become stricter on what type of RVs and where they can park on their properties. Make sure to check with a staff member before parking to ensure you don’t get towed overnight. Schools can be a quick way to find parking when you're in a jam, so long as you've attended an event there, donated to a cause, or the parking lot is empty. This is one of your last resort parking spots if you can't find anywhere else legal to park your RV. Some schools consider this trespassing; others don't mind so long as you are part of the community. Check with school officials before parking and make sure to stay for one night only. Pro Tip: Make sure to park exactly where school officials tell you to do so. Otherwise you may block traffic or cause issues for students moving about campus. If you're traveling cross-country and have a friend or family member in town, they might let you park for a night or two. Reach out to your network during your journey when planning to park on private property. Craigslist can be a quick way to find people willing to let you park in their driveway should you need it. 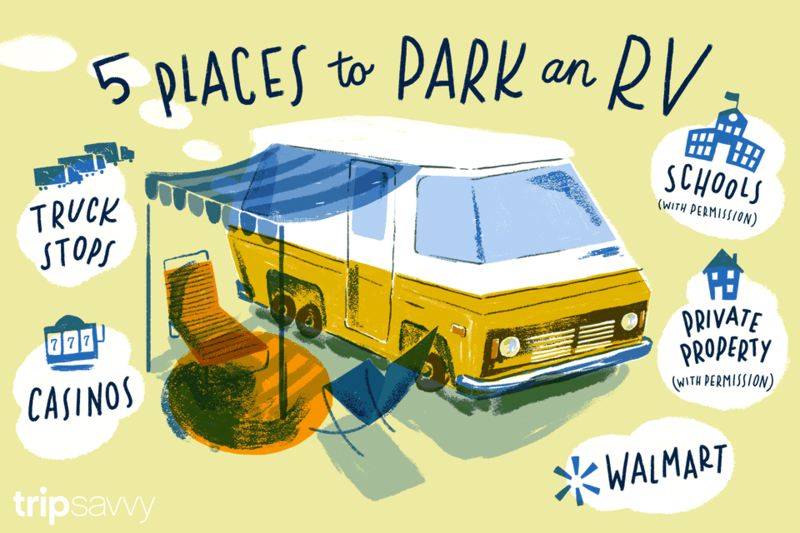 Services like RVwithMe and Outdoorsy can help you find private RV parking in a pinch, too. Pro Tip: Be mindful of city regulations to ensure parking on private property is allowed. More cities are banning RVs parking on neighborhood streets. If this is the case, and your RV fits in a driveway, you'll avoid a hefty fine. When parking an RV in an oddball place, make sure you check with the manager, owner or officials who regulate the area. This ensures you won't wake up in the middle of the night being towed. Some will be more than happy to let you park for a night; others won't be. Make sure you follow instructions on where to park, what rules are in place, and leave the spot pristine when you hit the road. As an RVer, you always want to make sure you're as responsible as possible when parking anywhere out of the ordinary.